Product #46619 | SKU 14000 | 0.0 (no ratings yet) Thanks for your rating! The K&M Drummer's Throne - Gomezz features a comfortable, foam-filled upholstered seat and a load capacity of 220 lbs. The tripod base feature rubber end-caps to prevent sliding and aid in support. The Throne is adjustable in height, featuring locking notches to adjust between 18-26" (455-655mm). 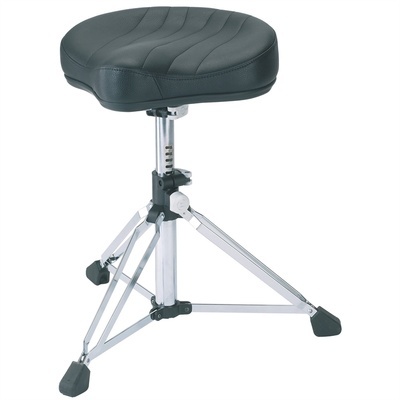 The detachable seat features an innovative die-cast flange, and is wobble-free thanks to a clamping lever which permits rotation from loose to fixed positions. Adjustable in height by a notched system, 10 mm-steps from 455mm to 655 mm max.